The smallest galaxies in our Universe are referred to as dwarf galaxies. They are dwarfed by galaxies like our Milky Way by their total mass, which can be as much as 10,000 times smaller than our galaxy. Even though they are the most abundant galaxies in the Universe, their low masses mean less stars and gas, making them faint and challenging to observe. 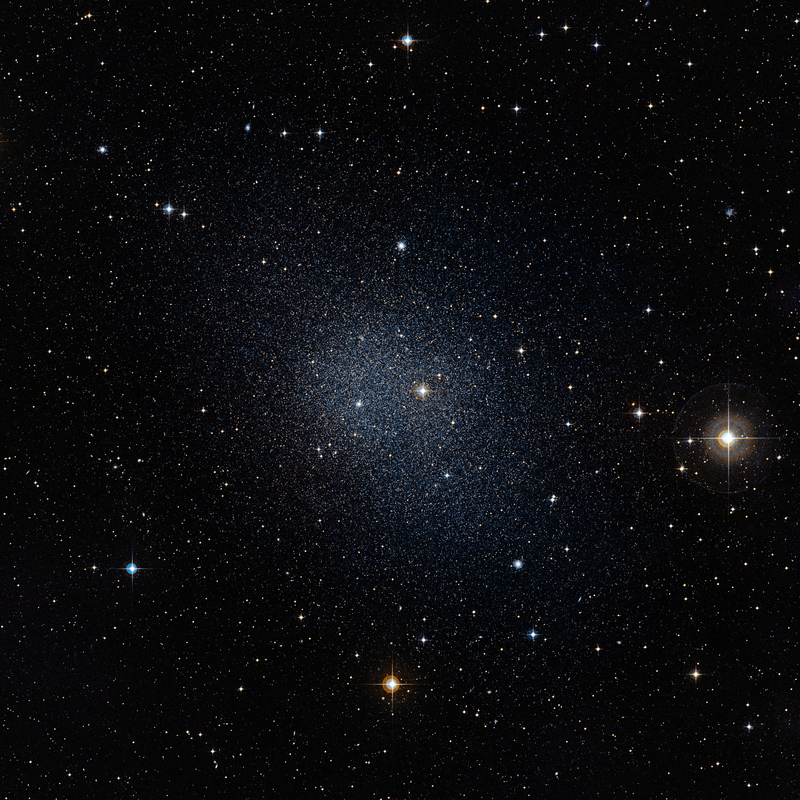 One common type of dwarf galaxy known as dwarf spheriodals (or dSph) are devoid of gas, and are observed as faint clumps of stars, like the dwarf galaxy in Figure 1. Observations of these dwarf galaxies suggest they they are dominated by dark matter throughout the entire galaxy, even more so than more massive galaxies like our Milky Way. Large, cosmological simulations of galaxy formation and evolution using the LCDM model for dark matter predict that the density of dark matter in galaxies has a “cusp“, or peak, towards the center of the galaxy. However, observations of these dSph galaxies have shown that they contain flat, central density profiles, called “cores”, rather than cusps. Figure 2, which will be discussed more below, shows an example of the cusp (green) and core (black). We don’t know how these cores form, and whether or not their existence represents a big problem in our understanding of dark matter. One possibility, however, is that cuspy dark matter profiles can transform into cored profiles through gas and star formation physics that is usually not included in large, cosmological simulations. The author’s of today’s Astrobite use analytical and numerical models to study how the movement of baryons, gas and stars, effects the distribution of dark matter in these galaxies, and how it may transform cuspy dark matter profiles to cored profiles. Astronomers currently don’t have a complete understanding of how dSph’s formed and evolved. However, we do know that during their evolution something, be it internal or external, must have removed their gas, leaving them the dark matter dominated clumps of stars we see today. The authors outline a formation and evolution scenario for dSph’s that forms the basis of their model. In the early universe, a low mass, cuspy dark matter halo forms. Over time, gas accretes onto the halo, eventually forming a gas disc. As the disc grows in mass, and the gas becomes denser, it eventually begins to fragment, breaking up into large, dense clumps of gas. In their picture, these clumps, if they manage to exist for long enough before they collapse further and form stars, feed energy into the dark matter particles. As the orbits of the clumps slowly decay, their energy is transferred to the dark matter particles contained in the cusp of the dark matter profile. With more energy these particles move outward from the center, flattening the cuspy profile into a flat core. Eventually, the gas clumps will start to form stars. As the younger, hot stars die, their supernova explosions drive out the rest of the gas in the galaxy, leaving a dSph galaxy behind. The authors’ goal is to test whether or not this picture can produce a realistic dwarf spheroidal galaxy with a cored dark matter profile. The crux of doing this is to be able to show that the massive gas clumps can form, and that they are massive enough and exist for long enough to influence the dark matter particles contained in the center of the galaxy. They construct two marginally stable gas disc models, T2 and T3, that contain 11.7 and 76.1 million solar masses of gas, embedded in a billion solar mass dark matter halo. Using analytic equations that determine the stability of these discs, the authors find that fragmentation occurs in these two models at masses of 1.5 x 105 and 6.0 x 106 solar masses respectively. This means that the gas in these discs will fragment to form clumps of the given masses. The authors then construct N-body simulations of these two model dwarf galaxies, building a the billion solar mass dark matter halo with 2 million particles of 480 solar masses each. For the T2 galaxy, they add 76 1.5 x 105 solar mass clumps, and for the T3 galaxy they add 12 6.0 x 106 solar mass gas clumps. Each of these gas clumps are represented by a particle in these simulations. They then evolve the galaxies, studying how the initially cuspy dark matter density profile evolves as the gas clumps orbit around the center of the galaxy. Figure 2 shows the evolution of the dark matter density profile for the T2 and T3 galaxies on the left and right respectively. The green line in each shows the initial dark matter profile. The black line shows the profile after 200 million years of evolution with the gas clumps, while the purple shows the evolution without the gas clumps. In each case, an obvious flat core is formed, though is much bigger in the T3 model. The authors show that gas clumps formed in dwarf galaxies with unstable gas discs are enough to transform a cuspy dark matter profile into a cored profile long before stars ever form. The authors predict that this mechanism should operate in all dwarf galaxies. Therefore, they argue that any dwarf galaxy today with stars has most likely undergone this transformation, and any dwarf galaxy with stars will likely not have a cuspy dark matter profile. However, the authors acknowledge that their model requires the gas clumps to survive for a few hundred million years. The lifetime of clumps like these is poorly understood. Current research shows that they can last for a few hundred millions of years, but that they may also be destroyed after only a few tens of millions of years. Further research on the lifetime of these clumps will help determine the feasibility of this model. However, this model represents a possible solution to the disagreement between dark matter cosmological simulations and observations of dark matter in our Universe. Thanks for an interesting review. When the orbits of the clumps of gas decay and energy is transferred, I assume this is gravitational energy? Since it’s the only way normal and dark matter interact. Thanks for this useful information, it has leave me with a better understanding. I was very curious about the formation of dwarf spheroidal galaxy, what is preventing the Astronomers from finding out what is forming dSph?